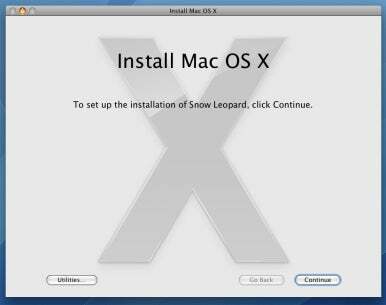 With Snow Leopard, Apple has streamlined and simplified the process of installing Mac OS X. While older versions of OS X made you decide what kind of installation you wanted to perform before you even specified what to install, Snow Leopard’s installer gives you a single installation path. It’s considerably easier. Gone, for example, is the old Clean Install option—which moved your existing OS and system add-ons to a Previous Systems folder and installed a fresh copy of the OS, requiring a good amount of tweaking and transferring of files afterward. Instead, Snow Leopard provides a more intelligent installation process that makes such tweaking largely unnecessary. The Erase and Install option is now gone, too (at least as a discrete Installer alternative; see “Simple steps, easy decisions,” below). While these are the official requirements, I recommend 2GB RAM and at least 10GB of free hard-drive space for a much better experience (both during installation and afterward). Before you begin installing, it’s also worth checking to see if your Mac requires any firmware updates; Apple offers a support article with more details. Similarly, if you’ve installed an aftermarket video card in your Mac, be sure to check with the card’s vendor to see if there are new Snow Leopard-compatible drivers you need to download and install. Let me also suggest that a major OS upgrade is the perfect chance to check your drives for problems, clean house, and check for updates for your frequently used software. (Don’t forget to check for new versions of preference panes and other add-ons that run in the background.) Finally, as with any major software update or upgrade, you should be sure to back up before installing Snow Leopard. When you insert the Snow Leopard DVD in your Mac and double-click the Install Mac OS X icon, you aren’t immediately prompted to restart as you have been with previous installers. Instead, you get to choose your install options immediately: just click Continue, accept the license agreement, and you’re taken to the options screen. Printer Support Snow Leopard makes choosing which printer software to install much easier than previous installers did. For starters, the installer automatically figures out what printer models you’ve previously used and installs drivers for them. By default, it also installs drivers for printers it detects on your local network, as well as for printers Apple deems “popular”—commonly owned printers from major manufacturers. With this collection of drivers installed, chances are you’ll be able to use any printer you come across. 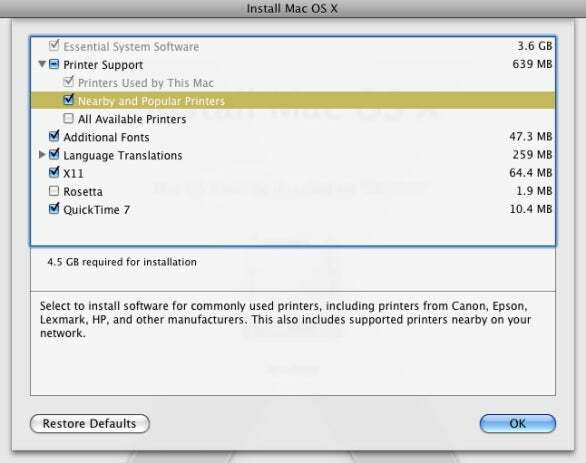 If you move around a lot and regularly use many “new” printers, you can check the box for All Available Printers, which installs every printer driver on the OS X DVD (see this Apple support article for details). But that may not be necessary, as Snow Leopard can download and install printer drivers on the fly (more on this feature in moment). Additional Fonts This option installs fonts for Chinese, Korean, Arabic, Hebrew, Thai, Cyrillic, Devanagari, Gujarati, Punjabi, Tibetan, Armenian, Cherokee, and Inuktitut. While you can’t choose a subset of these fonts, the whole package is small enough—somewhere between 40MB and 120MB, depending on which fonts you already have on your drive—that there’s little downside to installing them all. In fact, by doing so, you gain a number of specialty fonts that could be useful even if you don’t speak any of these languages. Language Translations This option installs support files that let you use Mac OS X—in other words, view menus, dialog boxes, and other OS-related text—in other languages. Though enabled by default, you can disable it to save a few hundred megabytes. You can also opt out of specific language translations; click the disclosure triangle to reveal the individual languages, and then check only the languages you think you'll actually use. X11 X11 is a windowing system used by some Unix software to provide a graphical user interface under Mac OS X. If you use X11, chances are you’ll know it. On the other hand, at approximately 64MB, it’s worth installing just in case you ever come across an app that needs it. Rosetta Disabled by default, Rosetta is the behind-the-scenes program that lets you run many PowerPC applications on Intel Macs. If there’s a chance you have older Mac software that never made the jump to Intel code, you should install Rosetta—although, as with printer drivers, Snow Leopard is forgiving here (see below). QuickTime 7 Snow Leopard includes a new version of QuickTime that claims to offer many improvements over QuickTime 7. However, the new version may not support some older media formats that QuickTime 7 handled with aplomb (see this Apple support document for details). Check this option to install QuickTime 7 for backward compatibility. If your Mac has an active license for QuickTime Pro 7, this option will be enabled by default. Even though you have all these options to consider, don’t spend too much time worrying about what to install: unlike Leopard and earlier OS versions, Snow Leopard can automatically download and install some software on demand. For example, if you didn’t chose the All Available Printers option and you later try to use a printer that's not supported by your original installation of drivers, OS X will connect to the Internet and download drivers as needed. Similarly, if you didn’t install Rosetta or QuickTime 7, and you later try to open a program or media file that requires that software, OS X will offer to download and install it on the fly (assuming you have an Internet connection, of course). In addition, if you forget to install something the first time, or if you’re having problems with an application and you want to get a fresh copy, you can easily install it from the Snow Leopard DVD by double-clicking on the Optional Installs.mpkg package inside the Optional Installs folder. After the installer launches and checks your drive for Snow Leopard, you can choose to install Rosetta, QuickTime 7, additional fonts, printer drivers, language support, iPod support files, X11, or any of the stock OS X apps (Address Book, iCal, iChat, iTunes, Mail, Dictionary, or Safari). After choosing your options, click OK and then click Install, verify that you want to install, and enter an admin-level username and password. The installation will begin immediately—the computer doesn’t need to restart first. If you’re using a Bluetooth mouse or keyboard, you may have to re-pair it at some point, but otherwise, the next interaction you have with your Mac should be when it reboots with Snow Leopard successfully installed. If you’ve set up your Mac to be able to boot into Windows via Boot Camp, you'll need to update the Windows drivers using the Snow Leopard DVD. Be sure to boot into Windows, insert the Snow Leopard DVD, and follow the instructions to update those drivers. Apple also claims that installing Snow Leopard on a Mac running Leopard will free up “about 6GB” of hard-drive space, but you’ll see this gain only if you installed a full version of Leopard, including all printer drivers. My testing on a 2009 MacBook Air that had only a subset of Leopard’s printer drivers installed showed more modest gains: just under 2GB of "new" free space. One of the other big changes the Snow Leopard installer brings is that it’s much smarter about ferreting out possible software conflicts than previous OS X installers. For example, the installer disables most input managers, kernel extensions, mail plug-ins, and system hacks that are incompatible with Snow Leopard or are known to cause problems. Some of these items, such as input managers and contextual-menu plug-ins, remain in place but aren’t loaded, because Snow Leopard no longer supports the mechanism by which they function. (For the most part; we'll have more on this soon.) However, others—incompatible kernel extensions, for example—are actively relocated. If you have any such items installed, you’ll see a dialog box, near the end of the Snow Leopard installation and setup process, alerting you to that fact. The dialog box will also tell you that these files have been moved to a new folder called Incompatible Software at the root of your hard drive. (See Apple’s Knowledge Base article about software that's incompatible with Snow Leopard.) You’ll obviously lose the functionality provided by these add-ons until their developers update them for Snow Leopard, but you should see fewer problems due to outdated and incompatible code. 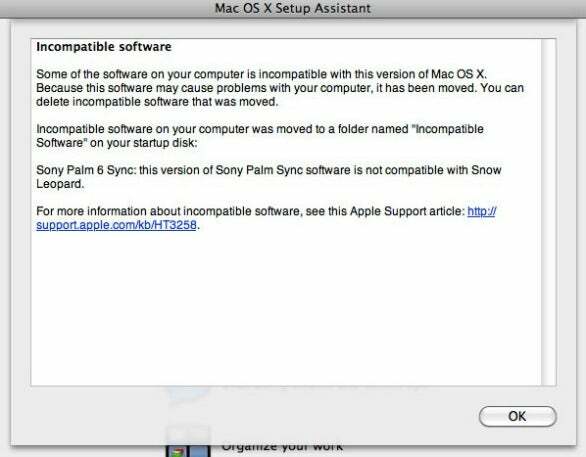 The Snow Leopard installer tells you if it's found incompatible software. How does the installer know what files to move? According to Macworld senior contributor Joe Kissell, author of Take Control of Upgrading to Snow Leopard , the installer has a built-in list of incompatible software, and if you have an active Internet connection, the installer even checks Apple’s servers for updates to the list at the time of installation. The Snow Leopard installer is also smarter about interruptions. If your Mac loses power or if an installation is otherwise interrupted, you can simply start over without having to worry that your drive or the OS has been been left in a nonfunctional state; installation will pick up where it left off. Next, on the computer on which you’re installing Leopard, open a new Finder window and select Remote Disk in the sidebar; the computer sharing the disc should appear to the right. Double-click the computer sharing the disc; you’ll see a Connected message, and the Mac OS X Install DVD will appear. (If the computer sharing the disc has the Ask Me Before Allowing Others To Use My DVD Drive option enabled, you’ll see an Ask To Use button; click it and, once the request is approved, you’ll see the Connected message.) Double-click the Install DVD icon, and then double-click the Install Mac OS X icon that appears. From this point, the installation should proceed as described above, albeit more slowly: installing Snow Leopard onto a 2009 MacBook Air from a 2009 Mac Mini over an 802.11n network—with the Nearby And Popular Printers, Additional Fonts, X11, Rosetta, and QuickTime 7 options enabled, and Language Translations disabled—took just over 56 minutes. If the new installer is so good, why would you want to erase your drive first—a process equivalent to the old Erase and Install option? The most obvious reason is if the standard installation procedure produced problems; an Erase and Install, followed by a restoration of your data from backup, could solve those problems. You might also want to consider this approach if your Mac has been acting buggy under Leopard and you suspect you may have some hard-drive or directory corruption; erasing the drive before installing Snow Leopard could fix such problems.